Liked the quirky look of the monkey and the lamp gives the warmth to the room. The little tussles came off, they are not secured. Dimensions 11.0 In. X 11.0 In. X 21.75 In. 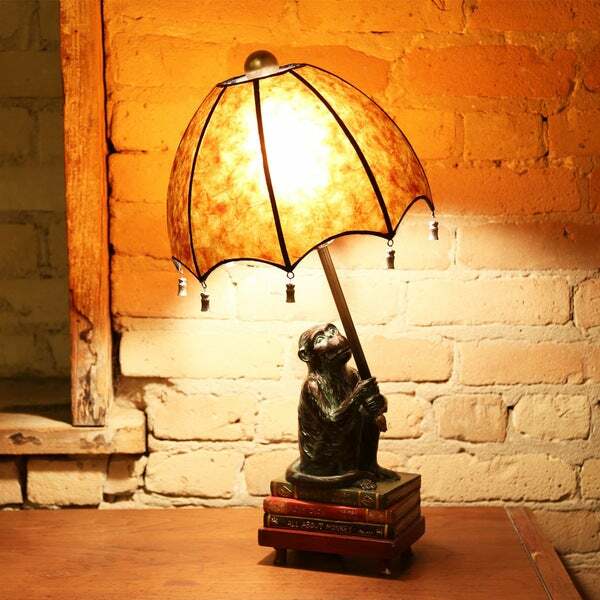 We love this whimsical lamp and it looks so perfect in our office/library. However, it arrived missing 3 tassels from the umbrella/shade. I thoroughly checked the packaging and did not find them. The missing pieces don't affect the functionality, but we're disappointed in the quality of the shade. It came very safely packaged and in good condition. The base is very heavy, so it feels sturdy and good quality. The details are great; I was worried it might look cheap or tacky, but it's actually very cute and made with attention to detail. I was a little concerned this would look cheap, but it’s a really nice and unique lamp. I’m really happy with it! Such a different style and looks lovely! OMG!!!! It lived up to every thing I was hoping for and got! My bedroom has a glow and a calm about it. LOVE,LOVE,LOVE IT. Thks. Love this lamp, brings a smile to my face everytime I walk in my office. I bought this lamp to put on a crank table I recently purchased also from Overstock. Both pieces compliment each other. It was very easy to put together. This lamp is very well made. I bought it for my living room and have received many compliments. I love this lamp! I would highly recommend. I got this for my mom and am in love with it and want to order another one! It is wonderful!!! It is very nice and looks good in an elegant office or living room! We are all in love with this monkey. Our new fav piece!! Quality is top rate and the detail of the monkey and books is awesome. Totally met my expectations for our hallway entry table. I love this little lamp. It's a perfect size and garners many compliments. I've seen similar lamps at other high-end retailers for three times the price. I'd buy it again. I am so in love with this lamp! Words I never thought I'd say! I knew I had to have it as soon as I saw it online, and I receive compliments on it daily! It's a treasure! The product is just fine but it took 2 tries and a combination of both shipments to combine parts and achieve one complete defect free lamp. Customer Service was exceptional to deal with and other then my time and a small label printing charge the return was only a minor inconvenience. This is that happiest little lamp ever! It is a bit bigger than I expected, but very well made. The details are lovely. The lamp is solid and the shade is very glowy! Love it! Love it! Just what my desk needed. A beautiful addition to my library. Its warm glow enhances the mood of the room. Qwerky monkey lamp which adds character and conversation to our sitting room. "How wide is this lamp?" Dimensions	11.0 In. X 11.0 In. X 21.75 In. "I am interested in this lamp..Can you verify that all the Tassells are attached & not missing any. Do you have a return policy also? Thank you very much, Bonnie"